My area has around 80% corn planted and close to 5% soybeans planted. We just received from 1" to 2" of rain, so no one is running now. The earliest planted corn (April 5th) has now emerged. We received .3" to 1.3" of rain. All of the corn is planted and some is starting to emerge. The corn looks great! We are planting our last corn plot of 2016! We have now started to plant soybeans. We are about 2/3 done planting corn, with 1/3 left to go and just started planting soybeans. We received anywhere from .4" to 1" of rain. Riley is currently on a mission for the Missouri National Guard, but he has been keeping in touch with those in his area. Most are done planting corn and now are moving to planting soybeans. My area has around 80% to 90% corn planted, but have not started planting soybeans yet. Overall, 20 to 30% corn is planted, but no soybeans planted as of yet. There was alot of rain in my territory on 4/21/16. We will be out of the fields for a few days. There was even some hail reported over towards Altamont, IL according to Burrus Dealer, Jason Berg. We are around 60% to 70% done planting corn. I believe corn to be 85% to 90% planted in my area. There is a small percentage of soybeans planted, including a couple of fields that I saw emerged in the Illinois River Bottom. Our seed corn crop at Arenzville is 57% started with at least one of the three plantings in the ground. 12% of our acres with all the plantings are complete. We also have the Hoblit 457LL soybeans planted as of 4/20/16. As of the morning of 4/21/16, we have had very little rain, so the planters are still running, but there is hopefully more rain in the forecast. 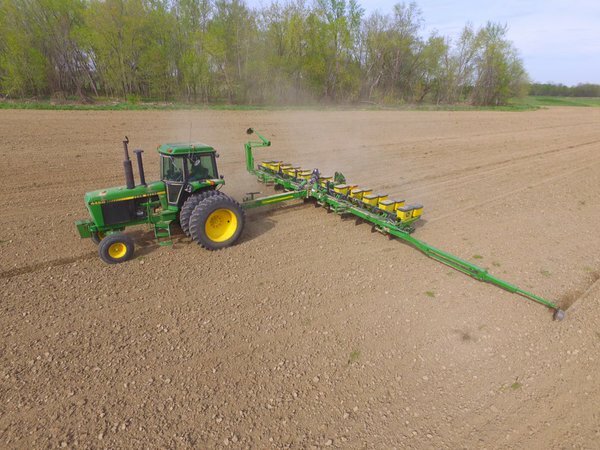 Several operators have kicked off corn planting in the McHenry county area. This would be considered ahead of normal planting date. We received .5" of rain at Woodstock, IL last night. Soils not particularly dry, but getting a bit wetter as you go north into Southeastern Wisconsin. There is less than 5% corn planted as of now, but if it does not rain tonight (4/21/15), things will start to happen really fast! Planting is just getting started up here with some corn and soybeans. The soil temperatures to just be getting fit, with plenty of subsoil moisture. Alfalfa getting done on lighter ground and just starting on heavy ground. Some corn being planted along the stateline. As of 4/21/16, it has not rained much. We have only received a .1" or .2" of rain. Most will plant next week.